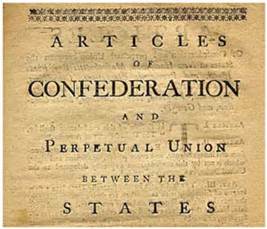 Over the next few posts I’ll look at the Articles of Confederation. Brent Dunklau, Convention of States District Captain, (HD 33 Texas) provided the spark for this series. Like many in the COS movement, he encountered pushback from Article V opponents who fear an Article V convention will replace the Constitution, just as the events of 1787-1788 replaced the Articles of Confederation (AC) with the Constitution. To opponents, these events were like a hostile takeover, a coup d’état by nationalists who illegally overthrew an imperfect but satisfactory system and imposed radical change. Did the federal convention and subsequent Constitution violate Article VI? If so, wasn’t it a breach of contract, unless every state didn’t care? Brent, as a well-informed volunteer, knows the states, and not congress, called the federal convention. Yet, through the exercise of their residual sovereignty, did the Constitution represent a revision of the AC, or a complete departure from it? Check out James Madison in The Federalist #40. Doesn’t he contradict himself in describing the Constitution as a new creation, and then later as a revision of the AC? So, what say you? Is our current Constitution just a renamed and revised AC (“so long as a part of the old articles remain”), or did all the states just agree that they should be released from the old contract in favor of the new one? Or is the answer “neither”? And is your answer an objective fact, or more of a firmly held opinion? Brent’s questions deserve deeper research into the 1775-1789 period. Several myths and misperceptions spin around that era. While there is no shortage of history in books and online regarding the months surrounding the federal convention and ratification debates, there is far less on the “bookends,” the 1775-1786 and late 1788 into 1789 timeframes. Over the next few posts, as I educate myself, I’ll relate an interesting and complex period that is little known and less understood. Thanks, Brent!